We are excited to announce a refresh for the Microsoft Jenkins offer in Azure Marketplace. Like the previous version, this offer allows customers to run a Jenkins master on a Linux (Ubuntu 16.04 LTS) VM in Azure. The price is the cost of running the software components and Azure infrastructure deployed by the solution template. If you are looking to run Jenkins in the cloud, you will have full control over the Jenkins master you set up. So why are we so excited about this refresh? Because now you can go from zero to hero. Just set up the server with the configurations you need and start building in the least amount of time. Virtual network: We added support for VNET so that you can provision Jenkins in your own virtual network/subnet. Azure integration: You can choose to enable Managed Service Identity (MSI) or supply an Azure Service Principal. We add the credential in Jenkins credential store automatically so that you don't have to do this manually. Choose off if you prefer to set this up later. Build: By enabling VM agent or Azure Container Instances (ACI), you can start building your projects in Azure right away. We create the default settings, so that you don't need to go through the arduous manual steps to add a cloud in the Jenkins dashboard. If you have any custom requirements, just edit the configurations to update the settings. If you enable VM agent, we add a new cloud called Win-Agent in Manage Jenkins→Configuration system based on a built-in Windows Server 2016 image and a Linux-Agent based on a built-in Ubuntu image. If you enable ACI, we add Aci Agents in Manage Jenkins→Configuration system. You can scale out to the cloud and run your build using a container agent created in Azure Container Instances. To try out, you can start from the Configure the Azure Container Agents plugin step in this tutorial, make sure you have the right label and docker image, and build the Spring PetClinic application in Azure. The solution template is open source. So, you can be part of the community and start contributing. Another new addition is the Azure Active Directory plugin which supports authentication and authorization via Azure Active Directory. In our latest release in 2018, we added project-based authorization so matrix-based authorization is not the only choice. 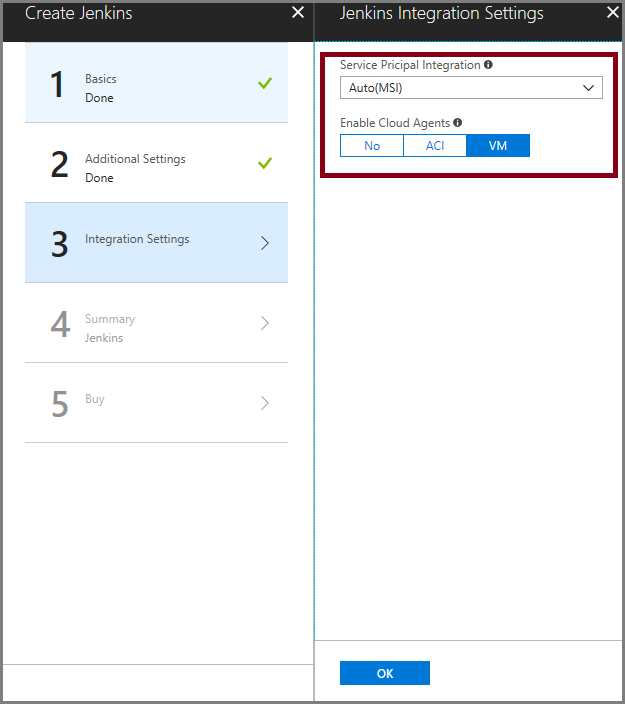 Did you know that you can back your Jenkins configurations up in Azure? Take a look at the disaster recovery script. Our team created this handy script you can use to mount $JENKINS_HOME to an Azure managed disk, also allowing you to reuse the Jenkins configurations on another instance. Let us know what you think and share with us what other support you'd like, either via comment below or email us at Jenkins Azure Support.